On the 6th May 2017 at 3am New Zealand time we got to the airport for our 6am flight back to Brisbane. Brisbane is two hours behind meaning it would have been the same as us waking up and staying up since 1am! We were greeted with sunshine which was a nice change from the cold weather in New Zealand (it was heading into their winter after all) and got the airport shuttles to the Banana Bender Backpackers Hostel which we chose as it was known for having long-term travellers living there. Getting into Brisbane wasn’t as straight forward as normal as we were pulled aside to have all of our bags thoroughly x-rayed and then searched. This was just a random selection and not because we looked suspicious (or so we were told!) The man was very nice (he was actually from the UK) who was searching our stuff and so we didn’t feel like we were in any trouble. What we had forgotten was that we had packed a giant sandwich bag of washing powder which we had fastened shut with black duct tape! This obviously looked suspicious so they had to do tests on ourselves and all our bags to make sure we weren’t smuggling in anything we shouldn’t be (luckily washing powder at least has a strong smell so I don’t think he really doubted that it was washing powder we were transporting!) We waited for the bag to be tested and was horrified when the guard told us it had tested positive for explosives! I can’t even describe the shock I felt when he told us the test was positive! 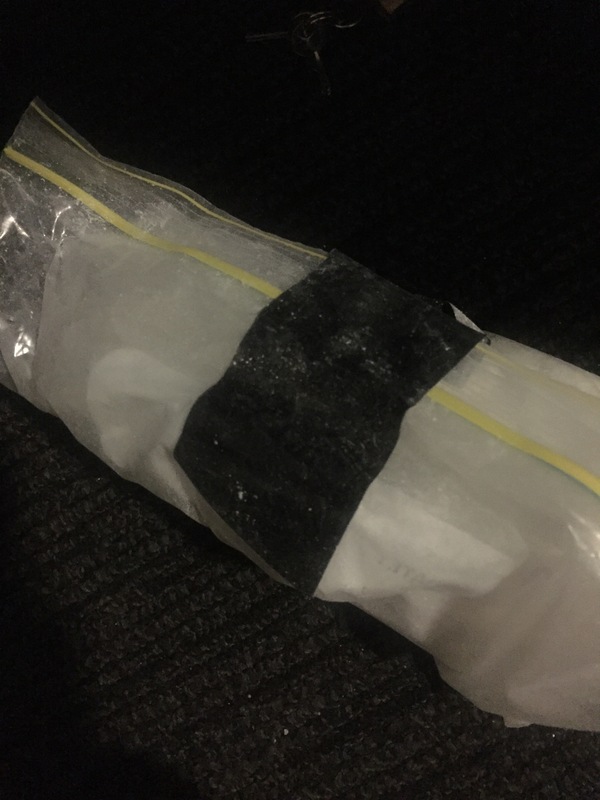 Thankfully, this is apparently normal for washing powder and we were allowed to go into Brisbane without being arrested or put on a watch list! We had a chilled day the rest of that day and went to the cinema to see Guardians of the Galaxy 2. The hostel was alright, we didn’t get much wifi (always annoying when you’re away from home) but it didn’t the job while we worked out what we would do next. 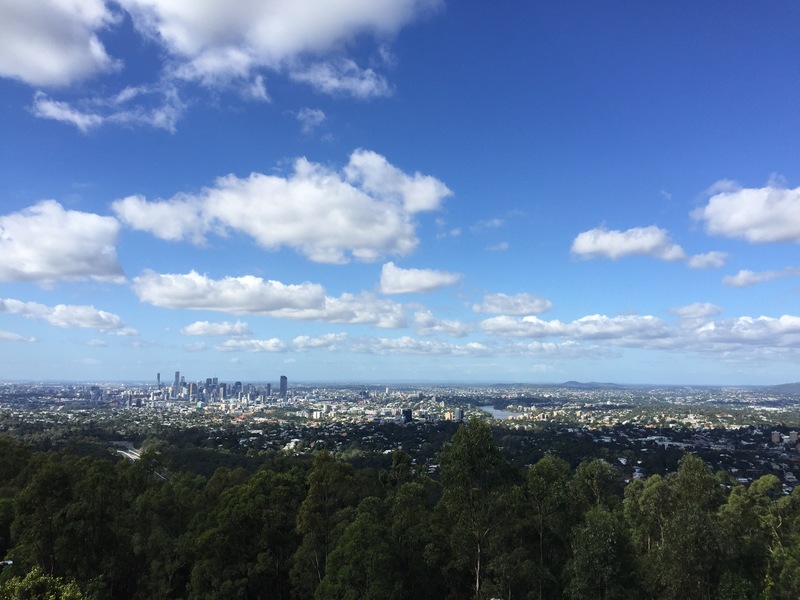 On Thursday 11th May 2017 we went to Mount Coot-tha. 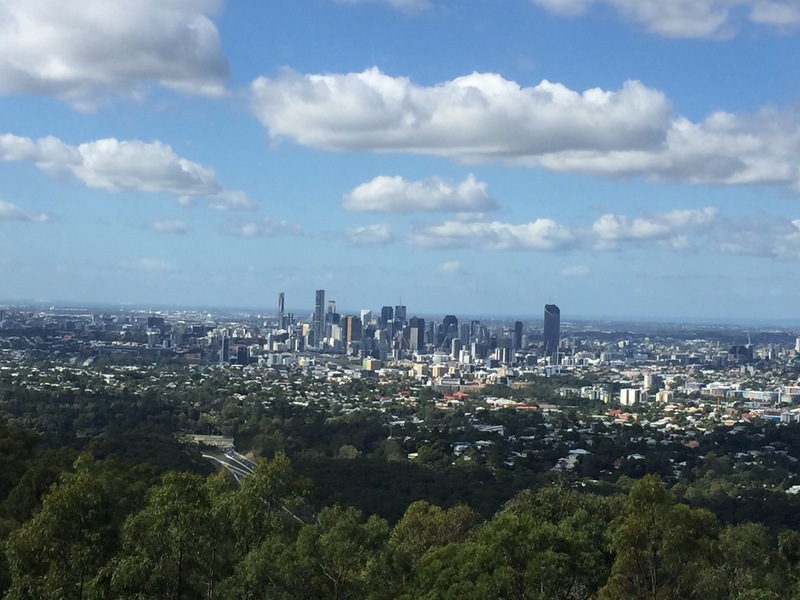 It was a really clear and sunny day and so we caught the bus which took us to the lookout at the top of the mountain and spent a few hours here enjoying the weather and the view of the city. 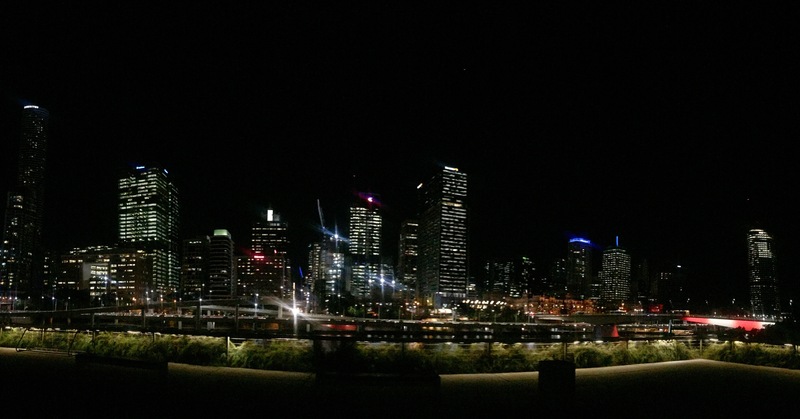 Brisbane is a really nice city and is a popular place for people at this time of year as places like Melbourne and Sydney are getting a lot colder. 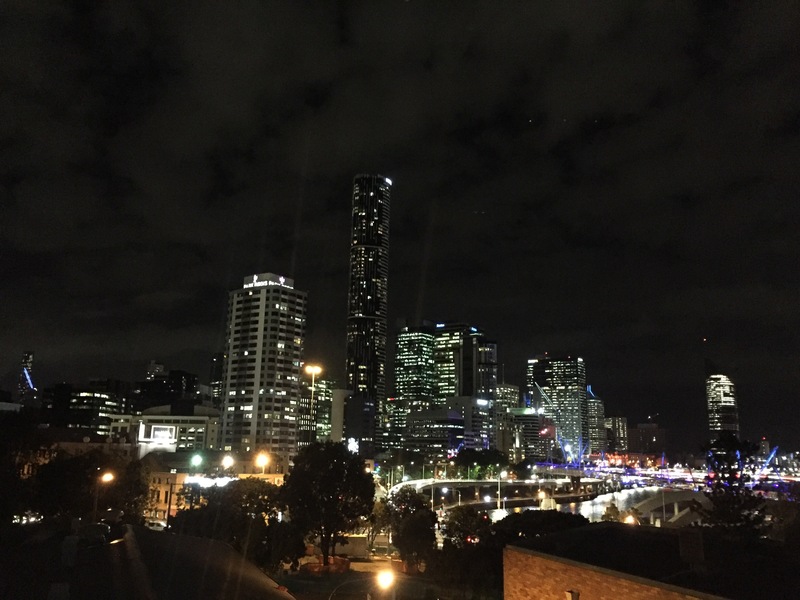 Our hostel has a rooftop patio and the views of the city at night are spectacular – it shows you the entire CBD skyline! We were able to get really settled in the hostel and made some friends from our room who were also staying long term; Katie, Charlotte, Amber, Tony and Connor. 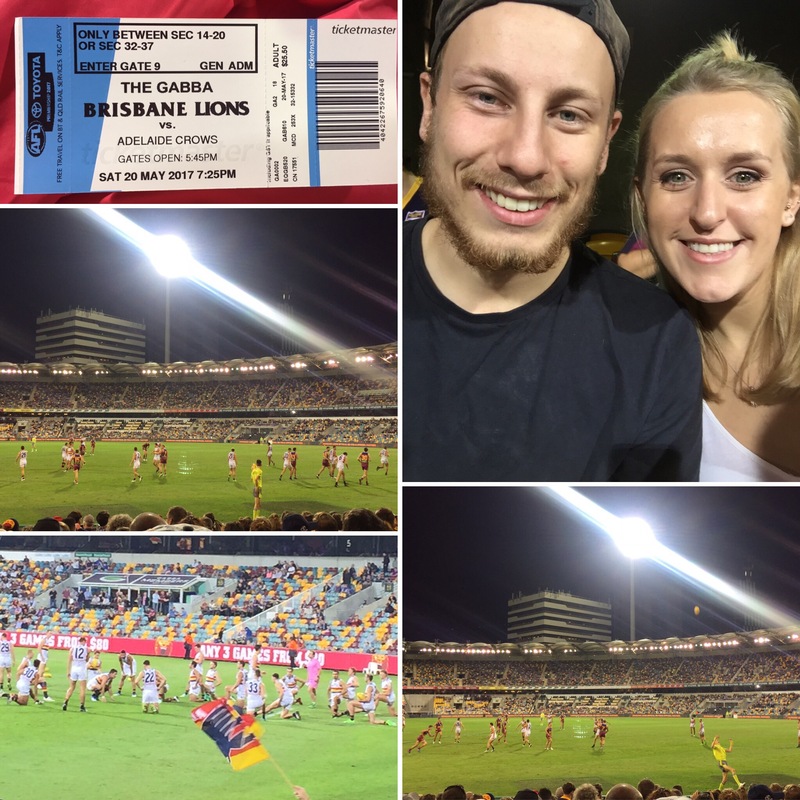 On Saturday 20th May we went to see the Brisbane Lions play the Adelaide Crows in an AFL game at the Gabba Stadium. Neither of us knew the rules but Niall had Googled it before the game so was able to explain to me the gist of what was going on. Someone has said to us that if you can’t understand the rules it’s because AFL doesn’t have rules and what he means if that often the players will do something one time and it be allowed and do what looks like the same thing another time and get given a penalty. They fight with each other a lot and it all looks slightly child like as if they’re on a playground pushing and hitting each other. I think it all looks quite clumsy but I imagine that’s because I have no clue what’s going on! There are 4 posts in AFL and if you get the ball through the middle two posts you get 6 points and if it’s through the outer two posts then you get 1 point. Brisbane had been winning until Adelaide scored a few 6-pointers and it completely reversed the game. The score board doesn’t have a total but instead has how many 6 points and how many 1 points are scored, I don’t really understand why they do that either. The players build is a lot more like a football player to a rugby player became of the amount of running an kicking they do – they must be exhausted by the end of the game! I think it was always expected for Adelaide to win the game as they’re near the top of the leaderboard and Brisbane are near the bottom. During one of the breaks between quarters someone proposed on the big screen! She said yes and the stadium brought them flowers and even got them a trip away somewhere! There were 13,802 people at the game and the final score was 7,18,60 to 21,14,140 (confusing I know) to the Adelaide Crows meaning they won by a huge majority! 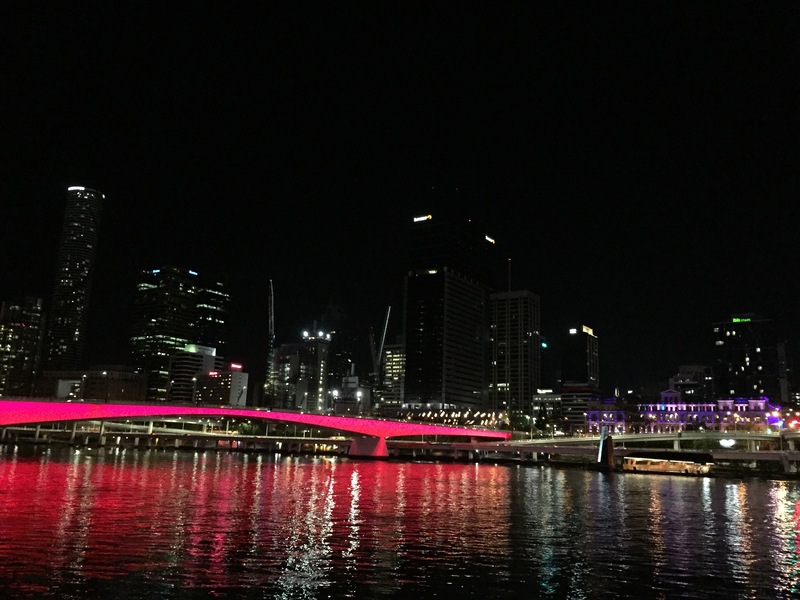 We walked back along the river which was really beautiful with the different bridges lit up at night. As you can probably tell, I found he game quite confusing and I think that was the reason I ended up getting quite bored by the end – you can only watch something you don’t understand for so long. Saying that, I’m still very glad that we went to see an AFL game and, overall, I did enjoy my time there.